Dad Kevin Armentrout was at the airport with his 16-month old daughter Carter Jean on Saturday night when he was struck by the kindness of a complete stranger. Carter Jean was doing what cute toddlers do, wriggling about, refusing to sit still, walking up to strangers and saying “hello”. “He reached out and asked if she wanted to sit with him. 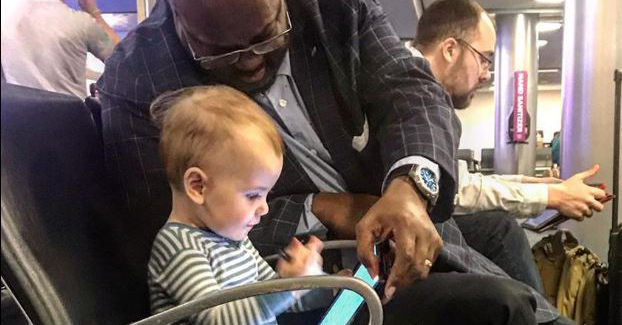 He pulled out his tablet and showed her how to draw with it, they watched cartoons together, and she offered him snacks,” Kevin recalled on Facebook. Cue: Complete heart melt, right?! As Kevin went on to write in a Facebook post, he was deeply moved by the man’s generosity and the connection he watched unfolding with his daughter. Of course, Carter Jean being a toddler there was also a few interesting moments! “She screamed and tried to get into his work calendar, but he couldn’t care less … She also offered him one of her cheesy puffs.” Cute! After boarding his plane, Kevin shared the story so the kindness message could be spread far and wide. The icing on the cake for Kevin was reading the wonderful comments people left in response. Especially the ones left by people who actually knew Joseph and vouched for his generosity of spirit. “Truly a wonderful guy, this doesn’t surprise me one bit!” another commenter posted. Moved by the comments, Kevin said the beautiful exchange between this stranger and his daughter meant more knowing he was clearly “the real deal.” A truly kind soul. Sure beats looking at your phone or trying to ignore everyone around you while you’re waiting for a plane, huh?